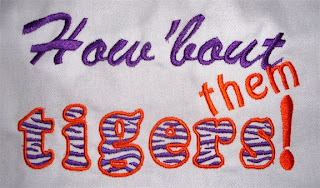 Today’s post will guarantee to put a smile on your face, even after this weekend’s heart break of a loss. Froo Froo Aprons™, a division of Cool Water Designs, LLC, is a family owned business that sells the cutest, most unique, fun aprons you will ever see. Each apron is handmade using all American made products and comes embellished with ribbons, embroidery, and sometimes a little “bling”. Any Clemson Girl would make quite the statement at their tailgate wearing a Froo Froo Apron™! Froo Froo Aprons™ is a big fan of Clemson (their model is a '99 alum), and has a variety of Clemson-themed aprons to choose from. 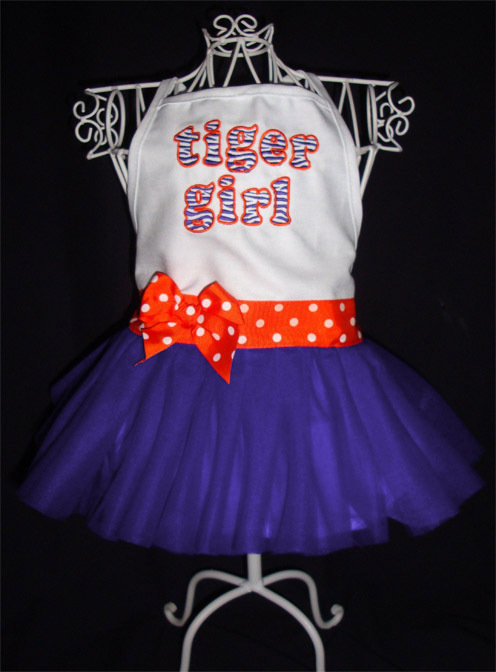 The company loves custom orders and encourages their customers to get creative with their requests. 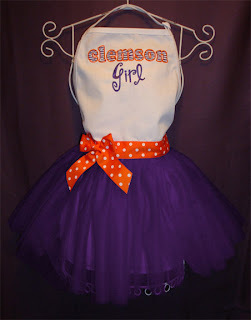 You can personalize your apron with your monogram, your name, your favorite team…pretty much any request they can handle. 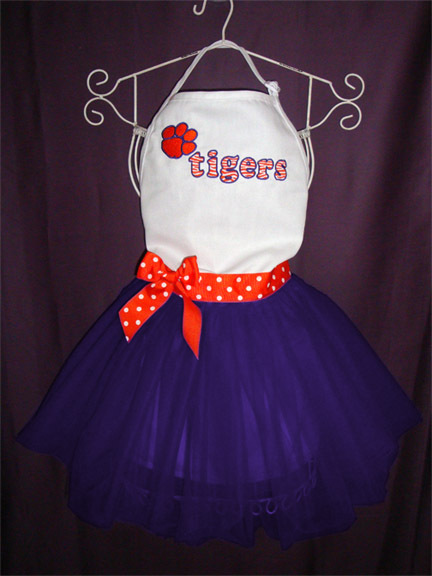 The Froo Froo Aprons™ are available in sizes from Toddler to Adult. How cute are these mini-aprons for your little Clemson Girls? 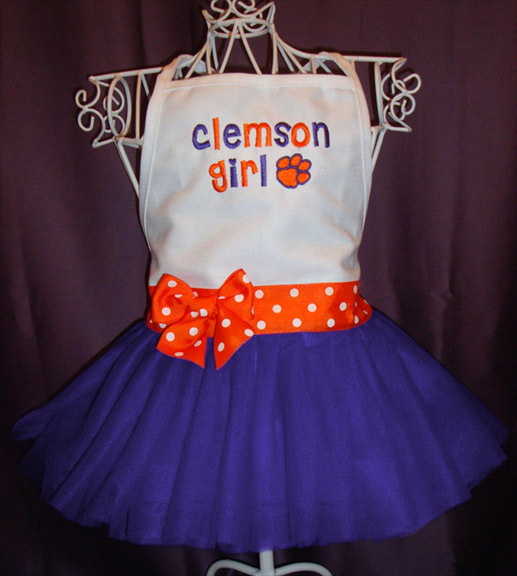 Have your daughter wear her Froo Froo Apron™ that matches yours and teach her how to set up the perfect Clemson tailgate. 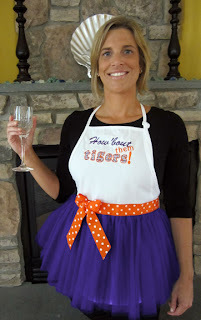 The Froo Froo Apron™ isn’t just for tailgating, but are also great fun for birthday parties, showers, girls’ night in and would make the perfect hostess gift. 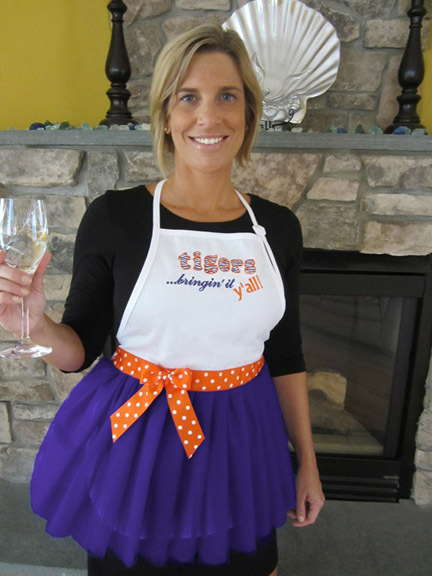 Froo Froo Aprons™ are not only adorable and fun, but durable and well-made. 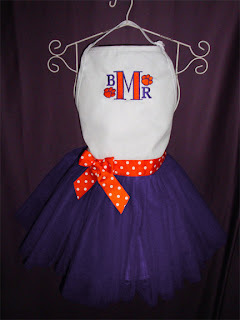 Bows on the aprons are detachable, making the entire apron machine washable for easy care. To make it easy for you to get a Froo Froo Apron™ of your own, all U.S. orders come with FREE shipping! 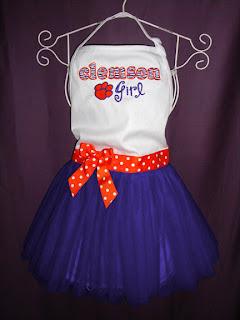 Froo Froo Aprons™ has generously offered to give away one of their super cute Clemson-themed aprons to a very lucky Clemson Girl reader. Deadline for all entries is tonight at midnight. We will draw a winner at random tomorrow, Sept. 26, and email the winner. The winner will have 48 hours to reply to our email or we will draw a new winner. 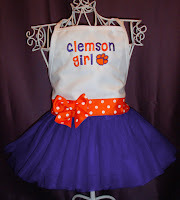 Special thanks to Froo Froo Apron™ for lifting our spirits with such a fab giveaway today!